Not surprisingly, there does not appear to be a magic “formula” to achieve top-ranked patient experiences. Rather, it appears to be the result of doing a lot of little things well, things that improve patient access, care timeliness, care appropriateness, care coordination, and the relationship between the practice and the patient, ultimately leading to a better managed practice. I honestly don’t believe it’s one thing that makes the experience good or bad. I think it’s a combination of things from start to finish, from the way the phone is answered when patients call, to the way a patient is greeted when they enter the office with a smile and a “good morning” or a “hello,” to how they are taken care of by the medical assistants. From the first interaction to the very last. It’s a team effort. In most cases, it’s the staff that makes the experience. People already have a connection with their doctor. We are blessed, with kind, caring and attentive staff that have worked together for years and have a cohesiveness. The doctors and staff actually “know” our patients. I believe that makes all the difference in the world. We strive to make the patient experience smooth and hassle-free. 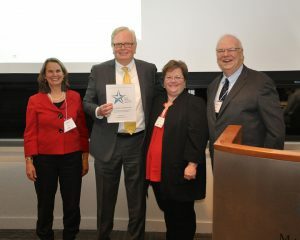 Dr. Thomas C. Johnston and Practice Administrator Ginah Ferriter receiving Hanover Pediatrics’ MHQP Patient Experience Award from MHQP CEO Barbra Rabson and Board Chair James Roosevelt, Jr. Providers communicate to patient at visits that they are aware of and up to date with specialists visits. Let them know that we are coordinating their care even when they are not in the office. Over half of our providers have been with the system for 10-20 years. You get to know people over time. We have a strong culture that patients are booked with their PCP for physicals if at all possible. As a PCP we will work to fit people in – and probably the better I know the patient the more I feel motivated to fit them into my busy schedule. We also try to have follow-ups made with the PCP. So if I see someone for an acute issue and they need follow-up I will try to have them book with their PCP. We care for extended families and across generations. Even providers who have closed panels will add in new siblings or even cousins of existing or former patients. We see the family as a unit, not just a bunch of individual patients. I would sum this up as continuity over time and within families. And, of course, I would brag that my faculty are just caring, nice people who enjoy the personal aspects of caring for patients. We are unafraid of delving into social complexity because we are willing to advocate for all the needs of our patients. Here are some thoughts from our two departments that serve pediatric patients. We treat everyone the same regardless of their coverage. We currently have a fantastic staff of patient access representatives that welcome people to the department whether from a phone call or face to face visit. We have paid considerable attention to this part of our care and have been lucky in our last 8 or 10 hires. We have very good teams working together and might have possible increased continuity from the patients’ perspective during our reorganization. Many of our CATCH patients actually have partial commercial insurance. This is an unparalleled program that meets people where they live to focus on whatever they need most, regardless of their individual conditions. Many hospital programs focus on predicting disease related complications. We have always focused on nutrition, communication, transportation, coordination, and access to community activities. Many hospitals have an asthma program. No local communities have a program that is currently as strong as ours. Our breastfeeding support in the first week of life is currently excellent. We listen! We take the time to learn about people’s socioeconomic and familial contexts and I think that helps us provide better care and patients see that we are accommodating our care plans to their circumstances. But that’s family medicine principle #1 (and one of the principle reasons I became a family doctor) so I don’t know how helpful that is for other clinicians. 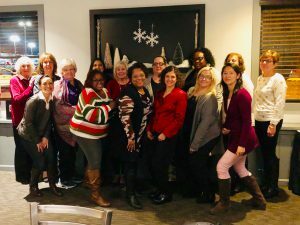 Also, the fact that the providers can connect patients with behavioral health providers, dentists, eye care, Community Health Workers, social service workers, domestic violence victim advocates, health insurance navigators, family supports, and more within HCHC really helps with their willingness to talk about these issues with patients. They know that there is a place for the patient to go for more help. The fact that community health centers often give providers more time with each patient given the usual complexity of their situations was recognized as not being a very helpful suggestion, but it came up over and over again. They did feel that in a small practice, they all get to know each other’s sicker patients to a certain extent, so that even if the patient can’t see their PCP, they see someone who knows their story. We make behavioral health assessment part of our annual visits (Annual Well Visit or Complete Physical Exam) and use a standard tool which is introduced by our nursing staff. Our staff is tuned into our patients’ emotional state. If there is a concern expressed such as anxiety, insomnia or depression the nurse will initiate the screening tool prior to the practitioner coming in the room. During office visits for refills of medication for anxiety or depression, the screening tool is reviewed. Since we are family practice, we see the same patients and know them quite well. This helps in identifying a potential behavioral health related issue. Our highest core value (yes, we discuss this at our staff meeting) is CARE. This is not only care and concern for the patient, it is care and concern for each other and it permeates our culture. Our staff will enhance the patient-to-doctor communication by letting the doctors know if there is anything going on with the patient’s personal life, birthdays, anniversaries prior to doctors seeing the patients. 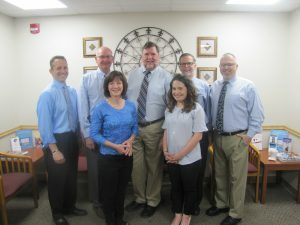 We also celebrate birthdays and each other through appreciation breakfasts/celebrations (nurse getting her LPN, nurse’s week, administrative assistant week, doctor’s day), in addition to saying thank you to our staff every day. 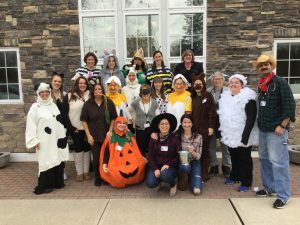 We try to create a family environment for each other, so that our patients can feel like they’re part of our family. Also, we created smaller care teams within our 5-doctor practice. Each physician is teamed up with a clinical and administrative staff to handle paperwork and all patient related work. This makes a larger practice become a much smaller practice for our patients. Patients then become more familiar with the staff that they interact with and this enhances their trusting relationship with their care team. In discussing our “best practice” models with our providers, there are several reasons we believe our patients feel that we truly care about them. Several years ago, our providers made the decision to purchase a private office building. This move allowed us to offer services in-house such as mammograms, bone density scans, labs, xrays and ultrasounds. The “all-inclusive” approach ensures a high level of compliance and patient satisfaction. We are able to schedule preventative exams such as mammograms and bone densities on the same day as a patient’s annual physical, reducing the number of visits a patient makes to our office. We have also implemented a workflow to schedule all annual preventative exams that need to be scheduled outside of our office for each patient. Once a result has been received for a particular exam, our staff schedules the following year’s exam and informs the patient. This reduces the burden on the patient of arranging all their appointments, which in turn leads to a high level of satisfaction. Another step we took to engage the patient in their health care was to institute the practice of mailing a lab reminder notice to all patients with an upcoming complete physical exam. The reminder notice asks the patient to have their labs drawn 3-7 days prior to their appointment in our office (once again the lab is located in our office building for convenience). Our Electronic Health Record (HER) has an integrated interface with the lab company that allows the electronic transmission of lab orders and results. In most cases the results are available within 24-48 hours, allowing the provider to review the results with the patients while they are in the appointment rather than needing a phone call follow-up after the visit. The patients truly appreciate that they can ask questions of their providers regarding their results while having their physical exam. Along with our EHR, we also instituted a patient portal early on (in 2007) and we have approximately 75% of the practice enabled to utilize this service for non-emergency requests or questions. This is a very helpful tool that allows ease of communication between the office and the patient in a secure environment. 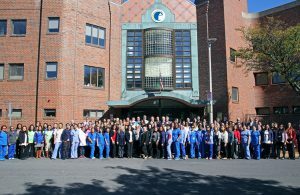 Last, but certainly not least, we have a truly dedicated staff that is warm and welcoming to all patients. Most of our staff have been a part of our practice for at least ten years, and many members of our team have over 20 years dedication to the practice and the patients. Each provider has one Medical Assistant, as opposed to a rotating staff, so they really get to know each patient personally and the patient knows them. This provides a stable, comfortable environment for all patients and providers. In discussing this with our PCPs and behavioral health providers in the office, we believe that we are successful in these areas because wethe extra time to really get to know our patients on the physical, emotional and social aspects of their lives. Knowing the patient on all of these levels helps us to build treatment plans that best fit with their values. We always provide several options, when feasible, and discuss with the patient what will work best for them, which empowers them to take an active role in their care. Since we address emotional well-being at virtually every visit, it has normalized a subject that can be taboo to some. This allows for increased acceptance of treatment regarding counseling and medication options that then lead to improved overall mental health. We have a social worker and psychologist based in our office allowing for warm hand-offs. This brings the opportunity for the patient and behavioral health providers to meet face-to-face in the moment. This reduces the hesitancy that some may feel to make an appointment outside of the visit. I believe from our practice’s perspective, LISTENING to our patients on every level has been key to our success. Understanding patients and meeting them where they are is important. It is also important to stay connected, to the extent possible. Whether it is a receptionist, medical assistant or nurse returning a call just to say, “I don’t have an answer yet, but I want you to know I’m looking into this,” or providing resources for patients and their families to access additional support or wrap-around care services. This allows patients to know we care about them, and they in turn care about themselves. 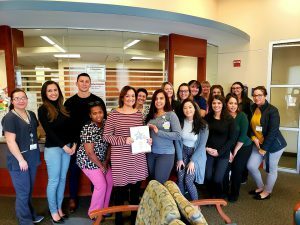 Our team strives to understand our patient’s cultural diversity and potential barriers, and engage our patients to make the best decisions for their health by developing self-confidence, self-esteem and coping skills to manage the physical, emotional, and social impacts of illness in their everyday life. Our team (which consists of practice manager, physician, nurse practitioner, registered nurse, medical assistants, and a medical secretary) conducts ongoing patient care outreach through a team approach. The practice manager reviews the health maintenance report for a patient and discusses it with the clinicians. The medical secretary contacts the patient for scheduling routine annuals and follow up visits. The medical assistant outreaches for routine health maintenance screenings. The registered nurse gets involved with complex patients with co-morbid diseases, patients that face barriers, patients that require interpreter’s services, and patients that refuse screenings. Any issues that arise during patient outreach are communicated to the practice manager who reviews the challenges, issues a report and/or discusses with the providers the next best approach for the patient’s care. We encourage our patients that, if they have any questions or concerns, small or big, to communicate with our office via their preference method – by calling the office, sending a message through MyChart, by fax, or by mail. 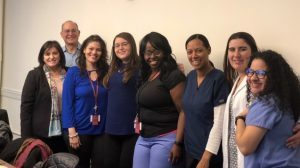 We try to motivate patients to express concerns, complaints and wishes by verbally speaking with a team member or the patient relations department at Mount Auburn Hospital. If they wish to remain anonymous, they can leave a note in the suggestion box. Any suggestion or complaint is communicated to the appropriate manager. The manager then reviews it and discusses with providers for any office policy change to avoid the scenario from occurring again. RE: Provider-Patient Communication – our providers use a communication tool to structure their conversations. They listen to their patients, speak to them in a way they would understand and answer any questions they may have. They do not leave the exam room until the patients’ concerns have been addressed. RE: Coordinating Patient Care – we do our best to keep patients within Reliant Medical Group so that all records, tests, etc. are in our electronic medical record. We have standards on timeframes in regards to addressing anything in their in baskets which include getting results to patients either by phone, letter or MyChart within a day or two of receiving the result. The medical assistant reviews medication lists at each visit and sometimes on the phone when the patient is requesting a new prescription.